Small ship cruise line Un-Cruise Adventuresannounced today that longtime executive Tim Jacox is stepping into a new role at the line as president and chief operations officer. 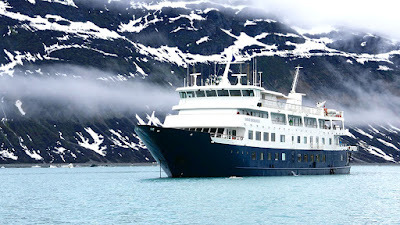 The adventure and river cruise company has a fleet of eight ships and sails in Alaska, Columbia/Snake Rivers, the Pacific Northwest, Mexico, Hawaii, and Central and South America. Jacox has been with the company for 14 years in executive management and sales and marketing roles. Previously, he was principal and executive vice president. Jacox partnered with Captain Dan Blanchard, principal and CEO of Un-Cruise Adventures in 2009 to reorganize and expand operations. Jacox is a 30-plus year veteran of the travel industry with 20 years spent in operations, sales and marketing, and executive leadership at the former Alaska Sightseeing/Cruise West. As president and COO, Jacox will oversee operations, marketing and sales, accounting and administration in the Seattle-based office. Executive leaders in the three primary departments will report to him. Stepping into this position rounds out a series of recent and ongoing initiatives as Un-Cruise Adventures expands, including investment in a new reservation system, development of a new website, support personnel, and additional office space. A search is underway for a vice president of sales and marketing. Blanchard remains principal and CEO with product development directors reporting to him. He plans to spend time meeting guests in Alaska, planning the company’s growth and developing new destinations and itineraries that fit the line’s specialty of small ship cruises along the West Coast of the Americas. He also looks after the company’s public policy interests and environmental stewardship. Blanchard is based in Juneau, Alaska but maintains an office in Seattle as well. With eight vessels plus one partner vessel carrying 22-88 guests, the company reports a carrying capacity of 13,350 guests on board its ships for 2015. In 2016, operations begin for the first time in the Galápagos Islands and Costa Rica/Panama. To book or to request additional information, contact your travel agent or Un-Cruise Adventures at 888-862-8881 or sales@un-cruise.com. Connect with Un-Cruise Adventures on Facebook, Twitter, YouTube, Pinterest , Google+ and Instagram.